Coffee purists will argue that the drip maker doesn’t offer enough control over the finished product. However, the ease of use and cleanup make auto-drip a very popular brewing method. The focus of this article is to discuss the basic principles needed to prepare a good cup of coffee so you can relate this to making great auto-drip coffee. Brewing coffee relies on some basic premises which should be taken seriously while discovering how to make great coffee. These are standards which have been arrived at and agreed upon through many years of research, trial and error, and many failed cups of coffee. The information that I am divulging did not come from my own private lab, but has been passed on from countless others who have paved the way for the rest of us. I can say that I have validated the results. To get quality brewed coffee, of course, you should be using quality roasted coffee which is fresh and properly ground. Even the best coffee machine on the market won’t maker your stale Folgers taste like anything but stale Folgers. Using clean water will make a huge difference in the overall taste of your brewed coffee. It will also help you achieve consistent coffee. Having ‘off’ flavors from tapwater such as chlorine, iron or other minerals in your water will taint your perception of the brewed product. Since purified water has no taste or odor to begin with, it can pass no taste or odor on to your coffee. This is the best way to be able to taste your coffee in all of its intended glory. In addition to making better quality coffee, purified water has benefits for your equipment as well. Lime deposits which normally form from the continual use of unfiltered coffee will not have a chance to form in your equipment. For more information on this and cleaning your coffee equipment, read the article Keeping Your Coffee Equipment Clean . To get clean water you can either buy distilled water at the store or use a water filtering device. Some of the newer automatic drip coffee makers have filters built in with replacement filters easily available. Water temperature is crucial to the proper extraction of the flavor molecules from the ground coffee. The recommended brewing temperature of coffee is 95-98 C. The sad truth is that many of the coffee makers on the market don’t come close to reaching the appropriate temperature right out of the box. Furthermore, if you don’t keep your equipment clean and it has formed mineral deposits inside, this will prevent the water from heating appropriately. Extraction time is almost trivial if the brewing temperature is correct. If the brewing temperature is hot enough, then the simple force of gravity will force water to drip out at just about the right rate. However, due to differences in basket design, some makers produce coffee that is over extracted. What this means is that the hot water has had too much exposure time to the coffee and is beginning to extract unpleasant flavors into the brewed beverage. Coffee should be brewed hotly and fairly quickly. For example, a 10-cup pot of coffee should take between 3 and 4 minutes to brew. Now that we have discussed the important factors in preparing good drip coffee, we shall focus on which coffee makers work best for each situation and then develop a composite of what might be the best coffee maker for you. I only mention this in this article because it is an important factor in the outcome of your finished product. It does not necessarily have anything to do with your coffee maker. People always ask how strong they should brew the coffee and the answer is simple: whatever tastes right to you. A good starting point is 1 Tbsp. per 6 oz water. The grind of your coffee should not be as fine as espresso or as coarse as French Press. If in doubt, ask your local roaster to grind it for you. As I mentioned before, these practices will not turn Folgers into Starbucks. However, even inferior coffee has a better chance of achieving greatness if these methods are followed. 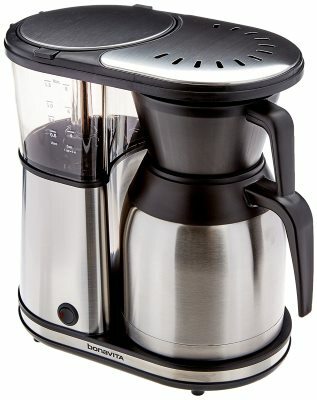 In Good To the Last Drip: Part 2, I will discuss how to apply this knowledge to shop for an Automatic Drip coffee maker that can best help you .